ACTIVITY in Elements, Periodic Table. Last updated January 30, 2019. Recognize element names from the periodic table. This activity was designed to be a fun challenge to test student’s familiarity the names of elements on the periodic table. It could be a used at the beginning of the school year with students, to gauge their prior knowledge and familiarity with element names. Alternatively it might be used during or at the end of a unit studying the periodic table. There are 30 element names hidden in the word search. Names are written both horizontally and vertically, as well as forward and backward. Some names overlap throughout the puzzle, sharing common letters. An answer key document has been provided for teacher reference. This activity includes three puzzles, each with differentiated instructions so that it can be used at a variety of grade levels. Beginner Level: these instructions are intended for younger students (elementary or middle school) with little chemistry background knowledge. Students are given a word bank, and are not held to a time restriction, although a teacher may choose to impose one. Intermediate Level: these instructions are intended for intermediate students (middle school or regular level chemistry high school) with some familiarity of the periodic table. Students are told to use the periodic table as a resource for finding element names, as well as told to focus on the first 20 elements. These students are given a 15 minute time limit to find as many element names as possible. Advanced Level: these instructions are intended for advanced students who are very familiar with element names, specifically the first 20 elements as well as other common elements. These students are directed to not use the periodic table, and are challenged to search for the elements based only on their prior knowledge. A 10 minute time limit is imposed on the advanced students. How much do you know and love the periodic table? Let’s find out! 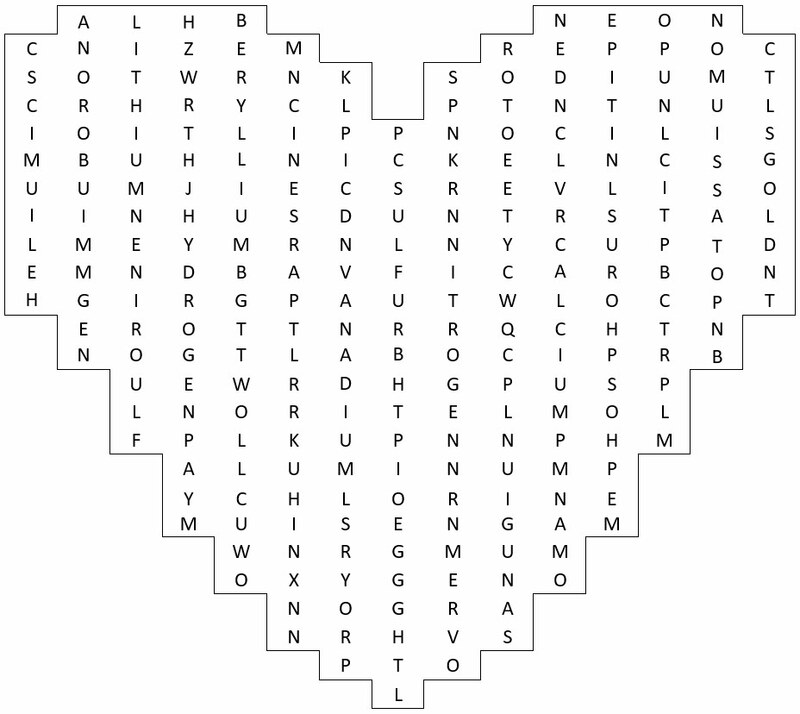 You have 15 minutes to find as many element names hidden in the word search below. You can use a periodic table, the first 20 element names from the periodic table are included. 10 additional element names are also included. The element names are written vertically and horizontally, but not diagonally. They may be written forward or backward. Good luck!